Sometimes, the best spots for food plots can be the toughest places to maneuver heavy equipment. If you can get there by 4-wheeler or foot and the area gets 3 to 4 hours of sunlight a day, Imperial No-Plow can give you a hardy, fast-growing crop of highly nutritious and attractive forage. 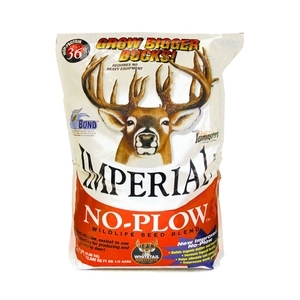 No-Plow is a high-protein annual that can provide up to 9 months of attraction and nutrition for optimal deer growth and antler development -- and preparation can be done with as little as hand tools.